Borne of Fire is the first release from a newly proposed Washington AVA. Borne of Fire is Ste. Michelle's showcase wine for a proposed AVA called The Burn, a region in south-central Washington that's located on a plateau next to the Columbia River. When it comes to innovation, Ste. Michelle Wine Estates has one of the better track records in the business. Its 14 Hands label, launched little more than a decade ago, now sells more than 2 million cases annually. A newer entry, Intrinsic, was introduced in 2016 and has already seen production triple to 130,000 cases. Now Ste. 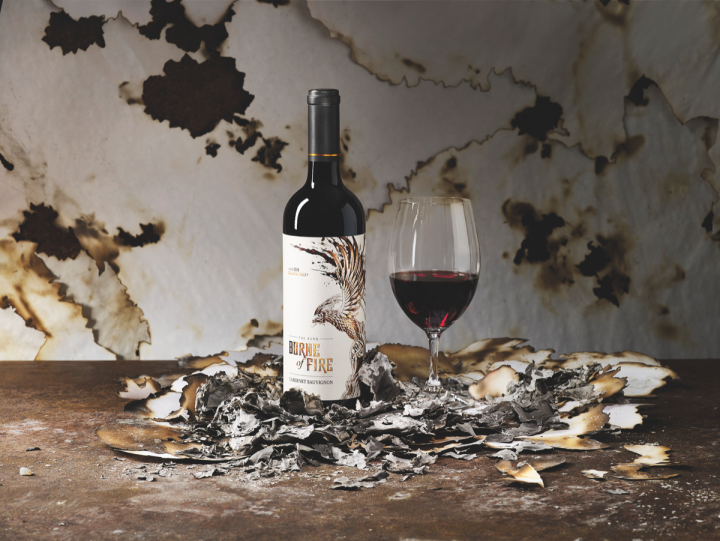 Michelle is looking to push the boundaries with Borne Of Fire, a new Cabernet Sauvignon that’s sourced from a proposed new Washington AVA called The Burn. The Burn is an agricultural area located in south-central Washington on a plateau along the Columbia River, nestled between the AVAs of Columbia Gorge and Horse Heaven Hills. Its name is inspired by the region’s earliest settlers, who would set their fields afire every autumn to regenerate the soil. The area—traditionally planted with potatoes, carrots, watermelons, peaches, and cherries—was first given over to vines in 2002. Initially, just a few acres of Cabernet Sauvignon were grown, but plantings expanded significantly in 2015. While the main varietal in the region is Cabernet Sauvignon, the mix also includes Malbec, Syrah, Chardonnay, and Sangiovese. Nearly all of the vineyards within The Burn are controlled by the Mercer family, Ste. Michelle’s longtime grower partners. The Mercers farm vines in the Horse Heaven Hills, Columbia Valley and Yakima Valley AVAs that are also contracted to Ste. Michelle, and they make their own wine through their Mercer Estates division. The Burn has a warmer microclimate than most of Washington’s growing areas, but also gets greater precipitation and moisture retention in its soil. Those factors create longer hang time for the grapes, notes Juan Muñoz-Oca, director of winemaking for the Paterson Group of Wineries at Ste. Michelle and the winemaker for Borne of Fire. “The Burn’s season is a little bit longer, and so we felt the conditions were ideal for growing Cabernet Sauvignon,” Muñoz-Oca adds. The proposed new AVA’s total land area is 16,780 acres, with 1,261 acres currently planted to vines. “We have a planting program that will take us to about 2,100 acres within the next couple years,” says Muñoz-Oca. The Burn’s scale would then be on a par with some very established Washington AVAs such as Red Mountain, which has nearly 2,000 planted acres, and Walla Walla, with about 1,650 planted acres. Borne of Fire ($23 a 750-ml.) rolled out in December and is available nationally. The brand is being given a fairly long initial runway for growth: 35,000 cases were produced from the inaugural 2016 vintage, with a further 60,000 cases planned for the 2017 release. For the moment, Ste. Michelle isn’t planning to add more varietal expressions to create a Borne of Fire range, as it plans to showcase Cabernet Sauvignon as the best expression from the region. For now, Borne of Fire will carry an AVA designation for the Columbia Valley, of which The Burn is included. If the proposed new AVA is approved, the brand will use The Burn appellation designation going forward. Ste. Michelle submitted the AVA proposal in September 2017, but there’s no specific timetable for a decision.